U.S. President Donald Trump and North Korea's leader Kim Jong Un meet at the start of their summit at the Capella Hotel on the resort island of Sentosa, Singapore, June 12, 2018. South Korean President Moon Jae-in welcomed the results of a summit between the leaders of North Korea and the United States, saying Thursday the talks helped move the region toward peace. Moon hosted U.S. Secretary of State Mike Pompeo for a meeting in Seoul to discuss Monday’s historic summit. U.S. President Donald Trump and North Korean leader Kim Jong Un signed an agreement calling for the end to North Korea’s nuclear weapons program, promising U.S. security guarantees, pledging to establish new U.S.-North Korea relations and to recover the remains of prisoners of war. Moon said Thursday he wants to hear how the two sides can fully and expeditiously implement the deal. U.S. Secretary of State Mike Pompeo shakes hands with South Korea's President Moon Jae-in during a bilateral meeting at the presidential Blue House in Seoul, South Korea, June 14, 2018. Pompeo expressed confidence that the United States “took a very good, significant step,” at the summit in Singapore. On Wednesday, Pompeo said the United States is hoping for “major, major disarmament” by North Korea within 2½ years. The top U.S. diplomat, after briefing South Korean officials in Seoul, said the U.S. “most definitely” wants verifiable North Korean action to denuclearize the Korean peninsula by the end of Trump’s first term in the White House in January 2021. 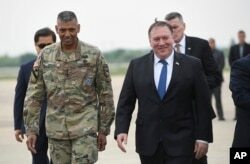 U.S. Secretary of State Mike Pompeo, right, walks with U.S. General Vincent K. Brooks, left, commander of United States Forces Korea, upon his arrival at Osan Air Base in Pyeongtaek, June 13, 2018. "I am ... confident they understand that there will be in-depth verification," Pompeo said, adding that further U.S. talks with North Korea on how and when it will end its nuclear program will resume "sometime in the next week." He said Trump and Kim reached understandings not written in the document they signed. "Not all of that work appeared in the final document," Pompeo said. "But lots of other places where there were understandings reached, we couldn't reduce them to writing, so that means there's still some work to do,. But there was a great deal of work done that is beyond what was seen in the final document that will be the place that we will begin when we return to our conversations." U.S. President Donald Trump and North Korea's leader Kim Jong Un shake hands during an expanded bilateral meeting at the Capella Hotel on the resort island of Sentosa, Singapore, June 12, 2018. ​U.S. critics of the deal said it was short on details and that Trump had made too many concessions to Kim, especially the U.S. leader's unexpected announcement that the United States is ending its military exercises with South Korea, long an irritant to North Korea. Trump returned to Washington, declaring on Twitter "There is no longer a Nuclear Threat from North Korea," even though the agreement he signed with Kim does not spell out how Pyongyang will dismantle its nuclear weapons program. North Korea's leader Kim Jong Un listens to U.S. President Donald Trump as they meet in a one-on-one bilateral session at the start of their summit at the Capella Hotel on the resort island of Sentosa, Singapore, June 12, 2018. Several U.S. lawmakers expressed their approval of Trump's meeting with Kim, but said they were skeptical of the U.S. leader's declaration that North Korea no longer poses a nuclear threat. "That would be hyperbole," said Senator Bob Corker, the Republican chairman of the Senate Foreign Relations Committee. "That's a great example of hyperbole," he added. "... Look, we're used to that. I'm glad the meeting took place. It's hard to discern yet if anything concrete occurred. .... It could be the beginning of solving a problem that would be good for our country and good for the world and I hope that's going to be the case." A Democrat, Senator Jeanne Shaheen, told VOA "the [North Korean] nuclear threat will not be over until they have dismantled their entire nuclear establishment and removed both their enrichment capacity and their weapons." "The way I interpret this first [Trump-Kim] meeting, which was surprising to everybody, is that it's like two boxers touching gloves. The real negotiations have yet to unfold," Republican Senator John Cornyn told VOA. Pompeo said Trump would resume the military drills if North Korea stops negotiating in good faith. 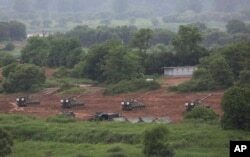 South Korean army's K-9 self-propelled howitzers take positions during an annual exercise in Paju, near the border with North Korea, South Korea, June 11, 2018. Trump assailed media skeptics of his agreement with Kim. The document the two leaders signed did not include details of how and when North Korea would denuclearize, nor did it spell out exactly what "security guarantees" the United States would provide to North Korea. 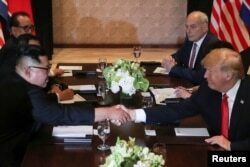 Critics pointed to the lack of specifics in the agreement while questioning whether Trump gave up too much while securing too little in return during his several hours of talks with Kim in what was the first meeting between a sitting U.S. president and a North Korean leader. Trump has defended the agreement as a major step in dealing with the threat of nuclear-armed North Korea and said he believed Kim's government would start the process of living up to the agreement right away. Former U.S. ambassador Bill Richardson told VOA he is concerned about no verification of what the North Koreans will do about missile technology in their country, no details of nuclear reduction or the peace treaty ending the Korean War from the early 1950s, and human rights. 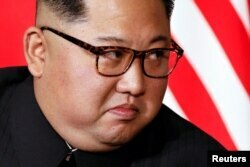 North Korea's official news agency on Wednesday quoted Kim as saying it is "urgent" that both North Korea and the United States "make a bold decision on halting irritating and hostile military actions against each other," while mentioning Trump's pledge to halt the military exercises. The report also mentioned that Kim invited Trump to Pyongyang while Trump invited him to Washington and said both accepted the other's invitation as "another important occasion for improved relations." Steve Herman and Bill Gallo contributed.